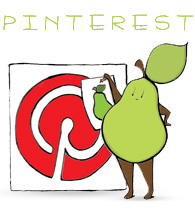 These pins are an expert way to show off your pearishness! They are available in Angry Pear’s Etsy shop. As you can see, I have many variations of color and pear types. So far, only a few sets are listed in the Etsy shop, but more will be available soon! And of course, you can always contact me if you want something specific.